An extraordinary, world-class event occurs every February in the mountains of Chiquimula, Guatemala, making Esquipulas one of the Earth’s major pilgrimage sites, rivaling Mecca, Vatican City and the Ganges River. The basilica that night, I felt as I strolled through the flowery gardens in front, seemed to be imbued with some special energy. Perhaps it was the effect of millions of pilgrims having passed by here, all focusing the power of their faith upon this one place. The Sanctuary of the Black Christ at Esquipulas is the most-visited site in all Meso-America, and the Catholic faithful of the entire region make every attempt to come here at least once in their lives. Hundreds of thousands make the pilgrimage every year, such is the faith people have in the miraculous power of the Black Christ. 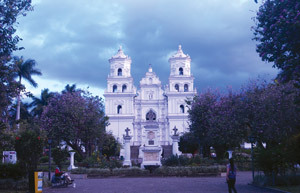 Archaeological evidence reveals that the Valley of Esquipulas has been a sacred pilgrimage site for thousands of years. Old World and indigenous Meso-American traditions have been melded into one magnetic field drawing in believers from around the world and making Esquipulas one of the Earth’s major pilgrimage sites, rivaling Mecca, Vatican City and the Ganges River. 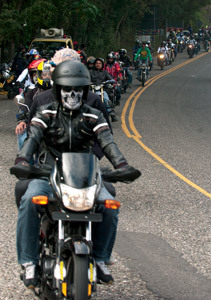 I was in Esquipulas to witness what was hoped to be the largest motorcycle pilgrimage on Earth. Dubbed the Caravana del Zorro (Caravan of the Fox), this extraordinary trek was founded 54 years ago by Guatemalan Rubén Alfonso Villadeleón, aka, The Fox. What began as a very personal pilgrimage by a small group of devout Catholic men has now become a massive, international event. Rubén is no longer with us, but his son, Eddy “The Fox,” now leads the caravan. 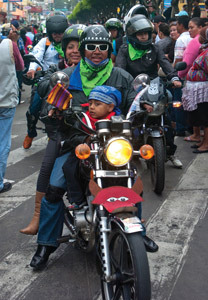 From all departments of Guatemala and from neighboring countries, even the U.S., bikers converge upon Guatemala City’s Central Park the afternoon before their cavalcade. All normal rules are suspended and many in the multitude camp out in front of the National Palace. At dawn the next day the caravan rolls out on the six- to eight-hour journey into the Motagua Valley and southeast through the mountains of Chiquimula. At 2 p.m. I situated myself by a tree-lined curve in anticipation of the caravan’s approach to Esquipulas. The first motorcyclists soon arrived, greeted by cheers from the welcoming crowd. As the afternoon wore on thousands upon thousands of bikers of every type and description zoomed by. 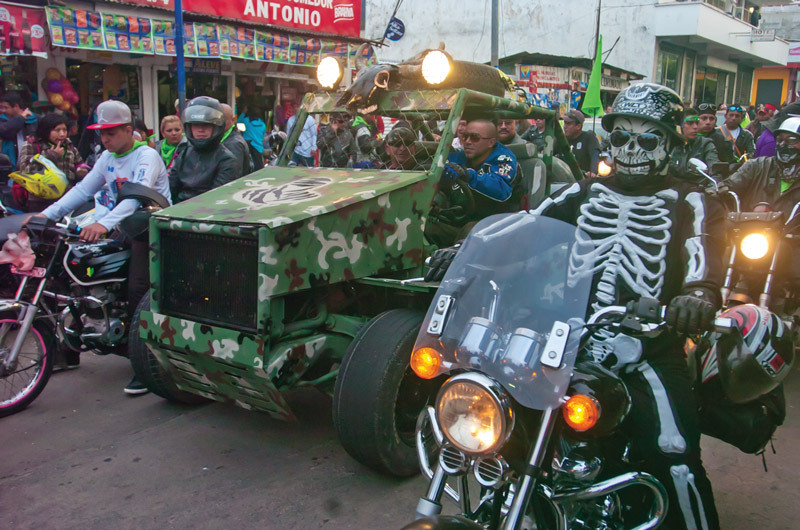 looking Vultures from El Salvador, the Mexican Hell’s Angels and the Disciples of Mayhem from Honduras. Many wore masks of every description: space aliens with dreadlocks, wild animals, and political figures like Barack Obama, princesses and trolls, lots of Guy Fawkes masks, and the ubiquitous Grateful Dead skull. boxes blaring, the streets packed with revelers, and the constant roar of the parading motorcyclists. 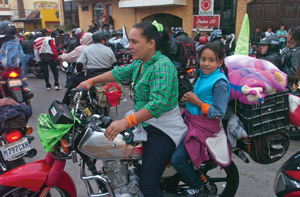 Officials later estimated at least 50,000 motorcycles were in the caravan, and many carried two to four passengers. The sea of faithful descending upon the little town must have numbered more than 100,000, possibly making this the biggest event in the town’s history since Pope John Paul II visited in 1996. Down the road, at the municipal park, a stage had been erected and live music was blaring. All the streets were lined with parked bikes. Business was booming for restaurants and street vendors, and of course every single room in every hotel was occupied. Sound systems had been installed on the streets, and the wild party continued well beyond midnight. Despite the fact that many were swilling copious quantities of beer, while others wandered from venue to venue, rum bottles in hand, the party remained completely peaceful. A spirit of family togetherness prevailed all night. Those who found a space set up their tents—mostly provisional structures made from plastic sheeting—on the lawn right in front of the basilica. Others camped on the airstrip adjacent to town. Finally, at about 2 a.m. the party wound down and eventually silence prevailed. At dawn the mood had shifted and the religious aspect the pilgrimage took center stage. The faithful joined the growing line waiting patiently for hours to file through the sanctuary, where the Black Christ is located. I had already received permission to position myself for a time in a corner just in front of and to the side of the Christ. I wanted to feel the people’s faith to perhaps understand why this place is so special for them. It had been cold the last few days; many waiting in line were coughing and sneezing. A few minutes later, as I was standing in the inner sanctuary, I suddenly realized that no one was sneezing anymore! Only the hushed sound of people praying could be heard. A mother lifted her baby above her head to get him as close to the Christ possible. An ancient-looking woman with tears in her eyes gazed up her God. Even leather-suited, tattoo-emblazoned bikers were extremely solemn and respectful. I DID feel the power of the faith from the crowd. I concluded that despite the fact that personally I do not worship statues or any other physical artifact, that if there is a God in heaven, the profound sincerity of faith here must be acceptable to Him. After visiting the sanctuary many made their way to an area designated for candle offerings, and the place was blazing with thousands of candles of every color, shape and size. 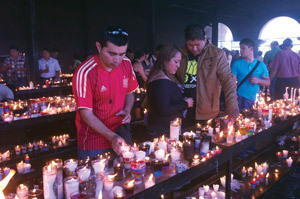 The faithful say a prayer and then light their candle as a way of communicating with their God. On nearby streets the Benedictine Brothers, in charge of the basilica, busily made their way from bike to bike armed with buckets of holy water and equipped with loofah-tipped broom handles with which to douse the vehicles and their owners with a special prayer for their safe journey home. 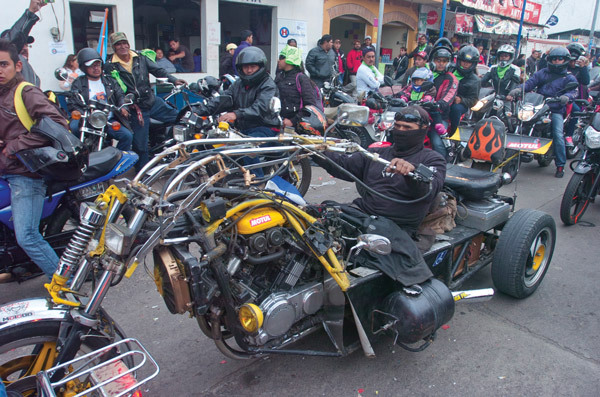 The organizers of the Caravan of the Fox had invited representatives of the Guinness World Records to verify whether the event is the largest motorcycle pilgrimage on Earth. Unfortunately, the Guinness officials, being sticklers for rules, disqualified it because too many participants did not abide by local laws. Special thanks to all the Benedictine Brothers at Esquipulas for hosting this event and helping this writer with research assistance. REVUE’s “Road to Adventure” text/photos by Capt. Thor Janson, navigator / explorer. Bet the caravan is amazing. Don’t tell anyone, miss biker parties from my neighborhood.